Suction evacuation for missed or incomplete abortion is one of the commonly performed procedures in obstetrics worldwide. Incomplete abortion, excessive postabortal bleeding, uterine perforation and infection are some of the complications of the procedure. Uterine perforation is one of the rare but serious complication of the procedure. Factors leading to perforation include training level of a care-giver, retroverted uterus, infections such us pelvic inflammatory disease advanced gestational age, previous operations on the uterus eg. caesarean section. Many cases remain asymptomatic and require only close observation, whereas some cases undergo short and long term complications requiring early management. 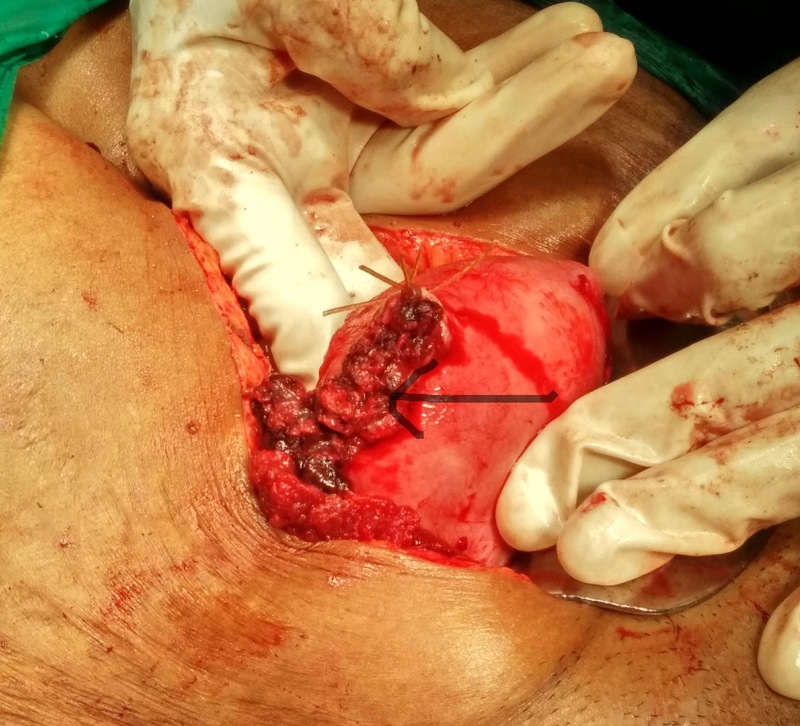 We present a case of 28 year old female referred to us in view of uterine perforation during suction evacuation for missed abortion with omentum extruding out through the cervix which was managed successfully in our institute. Suction evacuation is an optimal surgical procedure for missed abortion as it is safe, quick, easy to perform and associated with minimal blood loss. Uterine perforation is one of the complication of the procedure. Incidence is underestimated as many cases are unrecognised. Reported incidence is 5% in pregnant and peripartum women. Most commonly associated instruments causing uterine perforation are cervical dilators and the uterine sound. Most commonly perforated area is the relatively avascular fundus. Perforation can lead to injury to the surrounding viscera and blood vessels. Incidence generally depends upon self reporting by the surgeon and is underestimated as many cases are not recognized or confirmed. Diagnosis is made by surgeon’s suspicion of perforation when no tissue is obtained or the instrument is inserted deeper than expected, or dragging of abdominal contents through cervix. Ultrasonography, computed tomography, X-ray abdomen may be done to confirm the diagnosis. Management depends upon the cause and the extent of the perforation and the clinical presentation of the patient. If the perforation is caused by a blunt instrument and the patient is asymptomatic, monitoring for 24 hours is done. In most of these cases no intervention is required. Surgical repair is indicated in cases where signs of perforation are present or injury to the abdominal contents is evidenced. There are case reports describing small intestine,[2,3] appendix, omentum, and ovary entering the uterine cavity because of perforation. In our case, omentum was seen extruding out through the cervix for which exploratory laparotomy was performed. 28 years old female, married since 13 years G4 P2 L2 A1 with previous two full term normal deliveries had visited a private consultant with an ultrasonography report suggestive of missed abortion. Patient was posted for suction evacuation. During the procedure, uterine perforation occurred and omentum was sucked out and visualised through the cervix. Post procedure patient was immediately transferred to our institute for further management. On general examination she was pale and her vital parameters were stable. On abdominal examination there was minimal tenderness on deep palpation and no guarding or rigidity. On speculum examination omentum was seen coming through the cervix. On vaginal examination uterus was anteverted, corresponded to 6 weeks, os was closed with minimal bleeding and bilateral forniceal tenderness was present. USG was done which indicated a suspicious rent at the fundus on the right side with mild hemoperitoneum and blood clots in the pelvis highly suggestive of uterine perforation. Computed tomography scan of abdomen and pelvis was done which was suggestive of a 3 mm wide defect in the myometrium in the fundus with periuterine collection with pockets of air. Upper abdominal viscera was normal. In view of above findings the patient was taken for exploratory laparotomy with uterine rent repair. Intra-operatively there was small 2 x 1 cm cornual perforation on right side with small hematoma of 0.5 x 1 cm seen around the uterine perforation. Omentum was seen at the site of perforation going in to the uterine cavity and coming out at the cervix. Blood clots of approximately 160 grams were evacuated from the peritoneal cavity. Omentum inside the uterine cavity was removed by blunt dissection, the omental part of around 3 cm which had extruded inside the uterine cavity was excised and the rest omentum reduced back into the peritoneal cavity. Small bowel was traced and no injury was seen, as confirmed by surgeons. Uterine rent on right cornual side was sutured with chromic catgut no 2 in continuous interlocking manner. Haemostasis was achieved. Intraoperatively one unit of whole blood transfusion was given. Patient tolerated the procedure well and postoperative course was uneventful. Patient was discharged on day 8 postoperatively. Figure 1. Sutured uterine rent after removal of omentum from the uterine cavity. Suction evacuation is a commonly performed surgical procedure in obstetrics with overall low complication rates, and can be performed as inpatient as well as outpatient procedure. Uterine perforation is one of the rare complications and can prove serious at times. Acutely retroverted uterus, previous cesarean scar, previous abortion, advanced gestational age, infection, factors altering the strength of myometrium like breastfeeding and pregnancy, and cervical stenosis which makes endometrial cavity access difficult, are some of the factors contributing to the occurrence of this complication. Consequences vary widely from totally asymptomatic postoperative course to fatal outcomes due to severe hemorrhage and sepsis. Short term complications include severe hemorrhage and long term complications such as perforation in the subsequent pregnancy can occur. Other complications include extremely thin myometrium, sacculation and dehiscence. Most of the times diagnosis is made by the surgeon’s suspicion of a perforation and sometimes by observing the extrusion of the abdominal contents through the cervix. In most cases patients may remain asymptomatic and do not require any intervention. Observation for vaginal bleeding, changes in vital parameters and signs of peritonitis for 24 hours is mandatory. In cases where uterine perforation has led to injury to the abdominal organs, patient may present with nausea, vomiting, severe bleeding, abdominal pain, fever, tachycardia and in such cases operative intervention is indicated. Ultrasonography may be used to confirm the diagnosis. Complete blood count, serum electrolytes are done to detect the presence of infection and coagulation profile is done to exclude disseminated intravascular coagulation. X-ray abdomen may reveal presence of air in abdominal cavity. Computed tomography and magnetic resonance imaging may be done in some cases for confirmation. Finally laparoscopy or in some cases laparotomy may have to be done to confirm the diagnosis. Management depends upon the instrument causing the perforation and the extent of perforation. In cases where abdominal organ injury is confirmed, laparoscopy to confirm the site and extent of the perforation is performed and if the bleeding is minimal then first procedure is completed under laparoscopic guidance. In cases with severe bleeding exploratory laparotomy with surgical repair of uterine rent is needed. Cases have been reported where total abdominal hysterectomy had to be performed in cases of uterine perforation. In case where facilities are not available the patient should be immediately transferred to higher centre for definitive management as in our case. Preoperative cervical ripening using misoprostol may reduce the morbidity of the surgical termination procedure including hemorrhage, cervical trauma, incomplete evacuation and uterine perforation. McElin TW, Bird CC, Reeves BD, Scott RC. Diagnostic dilatation and curettage. A 20- year survey. Obstet Gynecol. 1969; 33(6): 807-12. Coughlin LM, Sparks DA, Chase DM, Smith J. Incarcerated small bowel associated with elective abortion uterine perforation. Journal of Emergency Medicine. 2013; 44(3): e303-e306. Augustin G, Majerović M, Luetić T. Uterine perforation as a complication of surgical abortion causing small bowel obstruction: a review. Arch Gynecol Obstet. 2013; 288(2): 311-323. Dignac A, Novellas S, Fournol M, Caramella T, Bafghi A, Chevallier P. Incarceration of the appendix complicating a uterine perforation following surgical abortion: CT aspects. Emerg Radiol. 2008; 15(4): 267-269. Ozaki K, Suzuki S. Uterine perforation with omentum incarceration after dilatation and evacuation/curettage. Arch Gynecol Obstet. 2013; 287(3): 607-8. Su S, Tao G, Dong B, Shi L, Dong J. Delayed presentation of uterine perforation with ovary migration after dilatation and curettage. Int J Clin Exp Med. 2015; 8(4):6311-4. Grimes DA, Schulz KF, Cates WJ. Prevention of uterine perforation during curettage abortion. JAMA 1984; 251(16): 2108-11.